Of all arts, dance is the one that encapsulates a country’s culture. I was thrilled to discover this link about Kamala here. My other dance connection is that I went to Women’s Christian College and Urmila Satyanarayana was my classmate. She is here. I am a failed dancer. As a child in Chennai, some of my most memorable visits were to my aunt’s house. 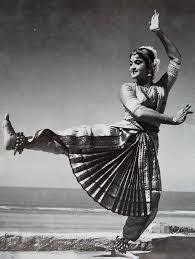 Her name was Kamala and she was known in dance circles as Kumari Kamala. My uncle, Major Lakshminarayan, was her second husband. 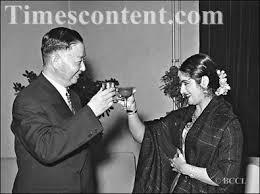 He would take us to The Music Academy, Madras, where we could sit in the front row and watch her perform. She received the Padma Bhushan and scores of other awards. To us children, however, she revealed quirky human foibles. I eat curry leaves today because Kamala mami mentioned in passing that it would help hair growth. My love of Bharatanatyam comes straight from time spent with her. Their home in Poes Garden was filled with beautiful young girls and the tinkle of anklets. Singers would be rehearsing and endless cups of coffee and tiffin would appear from the kitchen. To me, it represented a world of beauty, art, and apsaras (fairies). After my uncle died, my aunt emigrated to the US, where she still lives. She teaches dance and leads a quiet life. People still talk about what a fantastic dancer she was. She inspired this column, as she does anything I write about dance. Chennai’s dance festival opens today. We asked a few dancers and critics the same questions. 1. Who is your favourite dancer and why? 2. Teach our readers how to appreciate dance. Here are their answers, edited for length. 1. My favourite dancers are T. Balasaraswati, Yamini Krishnamurthy and Kumari Kamala. When Bala-ma won the Sangeet Natak Akademi award, there was some controversy about whether it could be given to a dancer. Bala-ma sang a snippet of a song about 20 times and emoted different feelings. She established without a doubt that dance is visual music. Yamini was a flame. She just set the stage ablaze with her dance. I used to watch her vitality, fire and joy with fascination. I was watching Kumari Kamala on TV the other day. What grace! What life! Today we have become obsessed with the geometry of dance. Dancers of the previous generation paid attention to subtexts, nuances, and poetry that went beyond technical perfection (Valli did not know that Kamala is my aunt when she mentioned her name). 2. I think the most important thing in dance appreciation is to have the courage to respond to it. Dance calls for an investment of effort from the audience. A willingness to receive. Does it touch you? Does it move you in any way? Can it transform you? Don’t worry about the reviews. Cultivate an aesthetic sensibility. Listen to good music. The arts sensitize and refine your spirit, but you have to invest in them. 1. To give one name for a favourite dancer would be impossible. 2. I think the specific things you should look for are: a) The technical grounding of the dancer, in all aspects—the pure dance aspect, the abhinaya (emoting) aspect as well the musicality and collaborative aspect with the musicians. b) I give a lot of importance to the content and whether the content of the dance has been literally expressed because this will only invoke a feeling of momentary appreciation…. For it to linger as a fragrance in your mind for years to come, the entire performance has to be transformative. Therefore, one needs to look at whether the content has been merely translated or whether it has been transformed into something else. Has it evoked in the viewer a sense of wonder and magic? That to me is one of the most important things. c) To see how the piece has been choreographed, keeping in mind the space where it is being performed, the lights used, the costume worn. Whether the aesthetics of the work are in harmony with the dance. 1. A good critic cannot have a favourite! But since you ask: Padma Subrahmanyam for her academic mind and divine art and decades of sincere service; and Alarmel Valli for her precision, spontaneity, clarity, class and depth of art. 2. Go with an open mind. Try to understand the literature/poetry of dance because therein lies its kernel. Don’t see the physical features, but the inner beauty of the dance/r. Look for substance and structure. Clarity of positions, delivery; standards in aesthetics and overall presentation. Hidden in the word heart is art. See from your heart, not head alone. 1. Sujata Mohapatra is the one dancer who stands out in my eyes. Not only is she a wondrous and brilliant dancer on stage, but also a charming, kind and compassionate human being off stage. When she enters, it seems sculptures have come to life and the finesse with which she dances, her technique, her abhinaya, almost everything about her can blow your mind away. Her strenuous dance regime and discipline is something many young and upcoming dancers should take note of. The Rudrakshya Foundation dance troupe. Photo courtesy Rudrakshya Foundation. 2. Watch as many dances as you can. You may never go into specific details as to which pose is what and what the name is, but once you have seen a large number of performances, you will automatically compare and will know good dance from bad. Also, since dance is all about aesthetic beauty, there is no specific need for the general audience to know the bhangis/charis/bhramaris (bends, specific leg postures, and movement patterns). Leave that for the critics and the scholars. The audience should just delve deep into the rasa. Talking about rasa (“emotions” would be an incomplete translation), classical dances are mostly made up of abhinaya, and any layman can understand the expressions of love, hate, jealousy, bravery, etc, just by looking at the dancer’s expressions. The only requirement is that the dancer should be proficient enough to portray them efficiently. Shoba Narayan wishes that Bengaluru had a dance festival to equal Chennai’s. I am in literature, particularly poetry and arts which include Indian classical music of north. I am rather thrilled by your description of Kamalaji and the comments of celebrities on their choice of great dancers. I like and watch ‘Kathak’ and these days my 8 year old grand daughter is learning and practicing Kathak. I still remember that A Kathak performance about a decade ago by Ms Uma Sharma enthralled me at the time and I am interested in Kathak ever since. In that performance She brought to life Mirza Galib’s poetry by her abhinaya (acting). Satyajit Ray’s “Shatranj ke Khiladi” contained a beautiful Kathak dance sequence on the Bandish by Nawab Wazid Ali Shah. I saw that film for times, only to watch that dance. 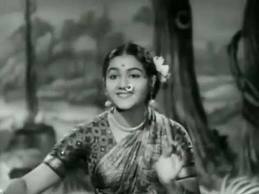 By the way Kamalaji’s photograph reminds me of Late Padmini, the film artiste as she looks like her ( to me at least. Thanks for this wonderful writeup. Yes, Kamala-mami has often been compared to Padmini (who I had the honor of meeting in New Jersey, at a temple). My daughter learns kathak, and so I am exposed to that fascinating world as well.